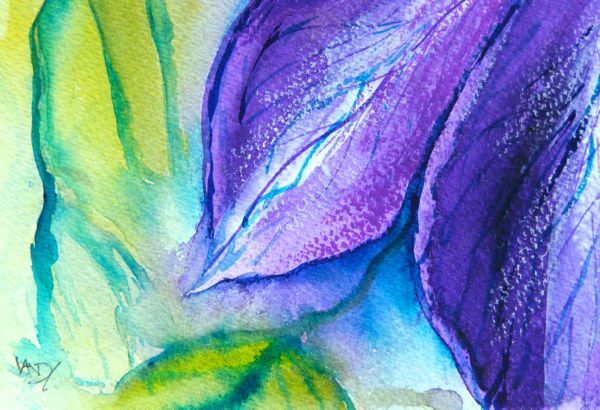 The second of my abstracts of watercolour flowers created from one original watercolour of a clemetis flower. Yesterday’s painting was about capturing the way big heavy plops of raindrops splatter off the petals of flowers eventually leaving them drenched. My follow on from that was to consider the verdant green and crisp clear colours that pop out immediately after the rainfall when the air is washed clean of dust and the plants seem to be taking great gulps of cool fresh air. I don’t know yet what the other paintings will bring. This is an exploration that is self-guided from the point of cutting the original painting into pieces. This is Day 28 of the 30 Paintings in 30 Days and my 94th painting for Running With Brushes.